Is your group larger than 29 people? Now we offer a large group game that we can bring to you! Great for team-building, retreats, and parties! Use the form below to schedule your next event with us. 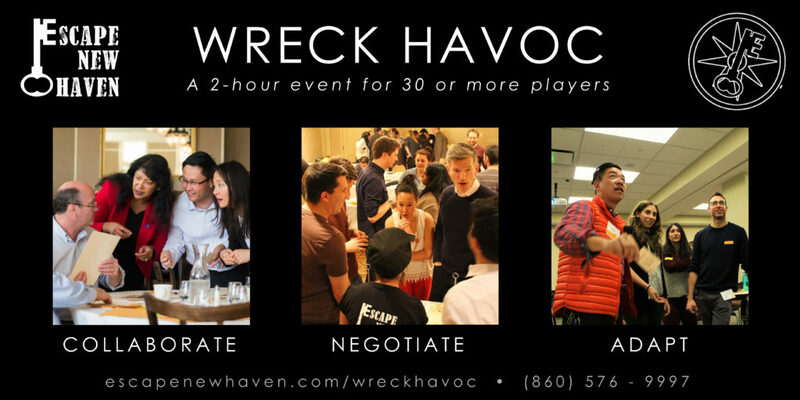 “Wreck Havoc” is our collaborative puzzle-solving game. Players need to decipher a lost ship’s final “distress signals” to discover the secret location of the wreck and recover its cargo for a reward. To win, teams need to negotiate, trade knowledge, and quickly adapt to new information if they are to succeed in this fast-paced game of teamwork and problem-solving. SKILLS DEVELOPED: teamwork, negotiation, adaptability, decision-making. Want to come check out our games at our physical location? Head back to our ticketing page. You can also check out this video to learn more about our company.